Solar photovoltaics is the fastest growing area in the energy sector. Of the us $71 billion invested in renewables worldwide in 2007, 30 per cent was in solar pv. According to market analysts, between 2007 and 2011, this industry is poised to grow at a whopping 73 per cent. 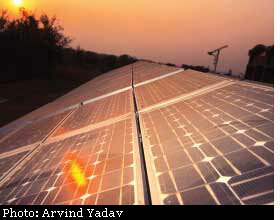 By March 2007, India had 120 mw of installed pv capacity. However, less than 2.5 mw is generated by grid-connected solar power plants. The rest is generated through stand-alone systems like solar street lighting (about 70,474), home lighting (4,02,938) and solar lanterns (6,70,059). The government has several schemes supporting and subsidizing various kinds of solar power systems.The emphasis is on encouraging manufacturing and industry rather than on installations as solar pv manufacturing is capital intensive. Through the special incentive package scheme, the government offers capital subsidies to state-of-the-art semiconductor manufacturing and related units, including solar pv. Eligible semiconductor "fab" projects must have a net present value of at least Rs 2,500 crore. The subsidy available is 25 per cent of the capital expenditure; it is 20 per cent for projects in a special economic zone. The response was good. "Most of the manufacturers who have applied under the scheme want to invest in photovoltaic technology. Proposals roughly worth Rs 1,40,000 crore from 14 manufacturers are lying with the ministry of which 12 are photovoltaic manufacturers" said K S Chari, director in the Union Ministry of Communications and Information Technology, the nodal ministry. Most of the proposals have been forwarded to a technical evaluation committee and decision is expected "shortly". The recently announced feed-in-tariff incentive scheme of mnre has also sparked considerable interest. The scheme is aimed at encouraging a small number of megawatt-level projects. Under the scheme, the project developer makes a power purchase agreement (ppa) with the state utility at the highest existing market rate. The mnre, through the Indian Renewable Energy Development Agency (ireda), augments this rate, to a maximum of Rs 15 per kWh. The maximum supplement incentive from mnre is restricted to Rs 12 per kWh. This will be reduced by 5 per cent for projects commissioned from the beginning of 2010 onwards. The supplement is available for up to 10 years. Till June the ministry received applications to set up pv plants totalling 2000 mw. The proposals are currently being scrutinized. Globally, solar pv projects are being installed in large numbers each year. 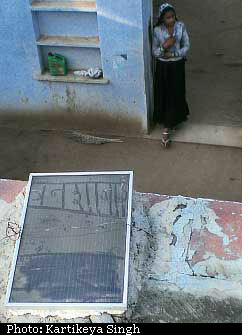 In 2007, more than 2,260 mw of pv capacity was installed, an increase of more than 50 per cent over the previous year. This brought the total installed capacity to 7,800 mw. About three-fourths of the total solar pv capacity was installed in Germany and Spain alone. If Japan and the us are also included, then over 90 per cent of pv installations in 2007 occurred in four countries. Germany currently accounts for about half of the world's installed solar power capacity--3,862 mw. This growth happened due to its market support measures promoting grid-connected rooftop systems and large pv power plants. Germany's innovative feed-in tariff (fit) scheme has been the main driver for the solar market. The German fit scheme, governed by the country's Renewable Energy Sources Act (eeg) guarantees generous fixed rates for all solar pv electricity generated for 20 years from completion of the project. An important feature is that the rate guaranteed for new projects decreases every year--currently by 5 per cent but this is set to increase in 2009. The decrease in tariff is part of the policy package as it works to push manufacturers to reduce costs and to increase efficiency of their systems. This tariff reduction encourages industry to develop cheaper, more efficient systems and to lower installation costs. The precise rates given depend on the system size and location. In 2008 they stand as shown in Table 2. The fit scheme is backed by favourable loans from KfW, a government-owned financial institution. Loans are provided in collaboration with individual banks; interest rates are dependent on credit ratings and the value of collateral, starting at 4.63 per cent. The programme as a whole has created a very large consumer base for solar pv in Germany. This, along with special financial incentives packages for manufacturing in certain regions and funding for research, has helped to create a flourishing pv production industry in Germany. Critics of the German scheme say it is too generous--the cost to energy consumers is too high and the use of such an expensive technology in a country with relatively low sunlight hours is inefficient. However, on the whole, it is estimated that the fit programme is responsible for an increase of 1.01 in monthly household electricity bills. California was the first state to introduce feed-in remuneration. Its tightly restricted feed-in programme will supply the development of up to 480 mw of total generating capacity (roughly equivalent to a small coal based power station). In all cases, feed-in contracts for 10-20 years can be entered only for installations up to 1.5 mw capacity and the range from us 8-31 cents per kWh, depending on the time the power is delivered--peak consumption time, winter or summer. As a result of this policy directive, the two big power utilities of the state--Southern California Edison and Pacific Gas and Electric Company have signed power purchase agreements--for 245 mw with eSolar and 500 mw with Bright Source, respectively. In 2007 around 70 per cent of all pv installations in the us were in California, which aims to install 3,000 mw in the next 10 years. The California Solar Initiative provides two kinds of financial incentive depending on the system size. Systems under 50 kW are eligible for the expected performance based buy-down, a one time, up-front payment. The size of the payment is calculated from the estimated output of the system, based on rated capacity, but also an assessment of the quality of the installation, including geographical factors such as location, tilt and shading. Systems over 50 kW can receive the feed-in-tariff. For both payment methods, the rates applicable are linked to the cumulative capacity installed under the scheme, reducing in 10 steps as capacity increases. Harnessing power from the sun is one of the biggest answers to challenges of energy security and climate change. Both solar thermal and photovoltaic will play a key role in addressing energy needs of the future. It is clear that the biggest challenge is to bring down the costs of solar pv-- by cutting costs or by increasing efficiency. The government has shown commitment but implementation and the nature of schemes have been found wanting. Take for instance, the heaters promotion scheme. "The problem with such schemes is that it comes through dealers designated by the government so it is difficult to trust the quality mostly," said Mathew Kochu SJ, director of Xavier's Institute of Technology in Mehsana district of Gujarat, who have installed solar heaters and lights in their entire institute. A national level certification and labelling programme is a must to ensure quality and performance. Once this is done laws and regulations like changes in building bylaws making it compulsory to install both solar thermal and pv features are the kind of reforms the sector needs. "Like Europe and the us, we should make at least two to three per cent contribution from solar generation mandatory. Then, policy-making on the same will become faster," said an ireda official. Finances and the limited technical know-how remain the key barriers for the solar projects in India. Innovations are needed to make solar projects financially and technologically feasible. A hybrid system or a system with high fossil fuel back-up, along with increased government technical and financial support and incentives, facilitation of technology transfer, will increase the market interest in csp technology. The Indian government has announced a generation-based incentive scheme. It is even considering ramping up solar generation to 20,000 mw. But finances will remain a big issue. The feed-in (or preferential) tariff provides an incentive to set up the plant, but it also puts a huge burden on the exchequer. This is why governments only extend the high tariff incentives in a restricted capacity. India's solar programme must therefore be able to source new funds--through a programmatic cdm-- instead of each project applying separately for cdm. The government can collect all the carbon credits from solar projects and sell it collectively in addition to securing international finances to pay for national mitigation actions. The money generated from selling carbon credits can then be used to fund feed-in-tariff schemes and reduce the subsidy. Reducing or even eliminating import duties, will reduce indirect costs and ease technology transfer from countries such as Germany, the us and Israel--the world leaders in technology. Its strong engineering and manufacturing foundation will surely allow India to become a leader in solar technologies in the future. After all, a massively scaled up solar programme is good for India. It is good for the world.